Today in Masonic History William Blackstone Hubbard passes away in 1866. William Blackstone Hubbard was an American banker and politician. Hubbard was born on August 25th, 1795 in Utica, New York. After receiving an education he read law with his maternal uncle and passed the bar in 1816. After passing the bar, Hubbard moved to St. Clairsville, Belmont County, Ohio. There he was the County Prosecutor for many years. In 1827 he was elected to the Ohio State Senate where he served until 1829. A few months after he left the state senate a bill he had drafted which would combine the Ohio Canal Company and Steubenville Railroad Company was passed by the Senate. The bill was passed before there were steam locomotives in use. In 1831, Hubbard was elected to the Ohio State House of Representatives where he served until 1833. In his first term he was elected Speaker of the House. It has been said that he “presided over the deliberations of that body with distinguished dignity and capability." 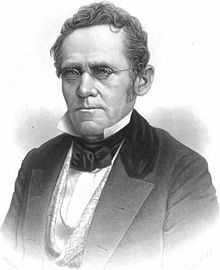 Hubbard was also involved in banking and served as the president of the bank St. Clairsville before he moved to Columbus, Ohio in 1839. Once in Columbus he served as the president of the Exchange Bank of Columbus and was president of the First National Bank of Columbus. He was also consulted by Salmon P. Chase, who was Governor of Ohio and Secretary of the Treasury for the United States, on financial matters. Hubbard served in the railroad industry as well. First serving as the president of Columbus and Xenia Railroad. Later he served as either director or president of a variety of railroads. Hubbard passed away on January 5th, 1866. Hubbard was raised in Rising Sun Lodge No. 125 while on a trip in New York. When he returned to Ohio he affiliated with Belmont Lodge No. 16 in St. Clairsville, Ohio. He then joined Chapter No. 9 Royal Arch Masons in Zanesville, Ohio. He was elected Grand High Priest of the Grand Chapter of Ohio. He was knighted in Lancaster encampment Knights Templar. He was made General Grand Master of the General Grand Encampment of the United States serving from 1847 until 1859. From 1850 until 1852, during his time as General Grand Master, Hubbard served as the Grand Master of the Grand Lodge of Ohio.